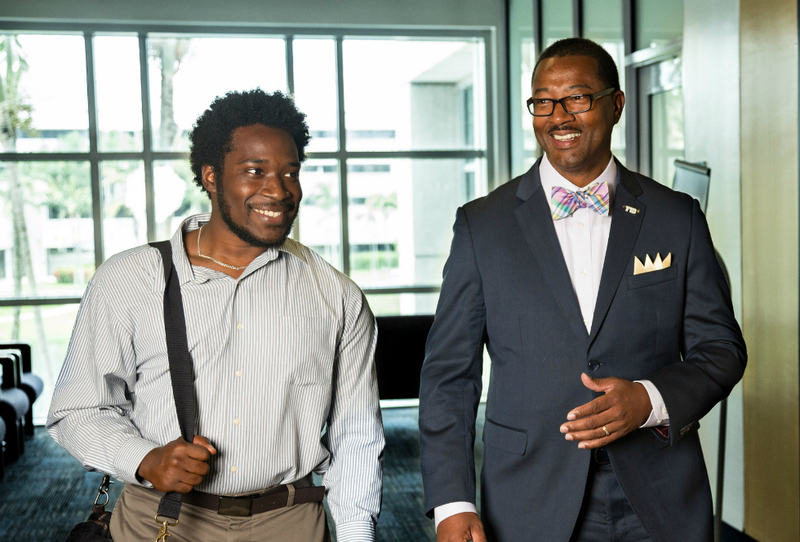 Jaffus Hardrick (right) is the vice provost for Student Access and Success, which offers mentorship opportunities such as the Golden Scholars Mentorship Program and the Fostering Panther Pride Mentorship Program. Lose weight and save money are often at the top of our New Year’s resolutions. While investing in your health and budget are important, there’s something else you can invest in this year: your community. Become a mentor. Lend a helping hand, share your experiences and help guide fellow Panthers on their route to success. A mentor’s impact can’t be measured with a scale or a bank account, but a mentorship relationship often changes a person’s life forever. Last fall, FIU Magazine published an issue dedicated to exploring the widespread mentorship relationships around FIU – and their ability to propel both mentee and mentor to growth. Since then, many of our readers have asked where they can sign up to become mentors. In response, we’ve compiled a list of some of the FIU mentorship programs available so you can find the right program for you to become a mentor! Golden Scholars Mentorship Program: This program allows faculty and staff to guide first-generation minority students. From meeting with their mentees regularly to participating in mentoring roundtables, mentors can share their experiences as well as their tips on goal-setting. To apply to become a mentor and for more information about the program, contact Tiffani Tallon at ttallon@fiu.edu or at 305-348-3848. Fostering Panther Pride Mentorship Program: This programs gives faculty and staff the opportunity to mentor students who were previously in foster care or homeless. By providing a support system as well as sharing their career and academic experience, mentors can impact their mentees in more ways than one. To become a mentor, contact Tiffani Tallon at ttallon@fiu.edu or at 305-348-3848. Faculty Mentor Program: In this program, seasoned faculty can become mentors to young faculty members and help prepare them to take on increased responsibilities and meet expectations such as teaching, research and securing funding. To volunteer as a mentor or for more information about the program, contact Associate Vice Provost Suzanna Rose at srose@fiu.edu or at 305-348-1975. Communities in Schools Mentorship Program: The Office of Student Access and Success partners with Communities in Schools, an organization that helps students stay in school, to bring high school students from underrepresented student populations to campus once a month and meet with their FIU mentors. To apply to become a mentor and for more information about the program, contact Tiffani Tallon at ttallon@fiu.edu or at 305-348-3848. LGBTQA Mentors Program: Faculty and staff can sign up to be a listening ear and a guide for students in the LGBTQA Mentors Program. From attending workshops together to mentor-mentee setting up their schedule to meet as often as they’d like, this program provides a resource for LGBTQA students. The Student Support Services (SSS) Peer Mentor Program: Offered as part of the Student Support Services program, which serves students in the federal TRIO program, the mentorship program matches freshmen SSS students with junior or senior SSS students who are in the same major or career field. Peer Mentor Program: Students can step up to the plate and sign up to be a mentor for other students taking the First-Year Experience Course (commonly known as an SLS class). The student mentor attends classes along with the students and provides a student perspective on adjusting to college life. Male Mentoring Initiative: This program calls upperclassmen, graduate students and faculty or staff to become mentors to undergraduate men. From workshops on topics such as what male masculinity means to mentor-mentee biweekly meetings, participants are provided with resources so they can successfully stay in college and earn their degrees. Medical Student Mentoring Network: Incoming first-year medical students get matched with second, third, or fourth-year medical students as mentors. From sharing tips on how to adjust to med school and excel academically to having bowling nights and ping pong tournaments, peer mentors get to help out their fellow students. For more information contact Kayla Laureno at klaurean@fiu.edu. Additionally, medical school students run a program in which they mentor undergraduate pre-med students. To learn more about this program, you can email FIUPump@gmail.com. Business Mentor Program: This program, run by the College of Business and the Alumni Association, matches business alumni with current students looking for a mentor who can tell them about their field and share their top career enhancement tips with them. Alumni Association Programs: The Alumni Association offers various programs in which alumni can engage with students. Programs like the “Dining with 12 Panthers” – students getting to share a meal with an alumnus or alumna – and the annual Panther Alumni Week, which has graduates going into classrooms to share real-world stories, while not mentorship programs per se, offer opportunities for alumni to meet students and for mentorships to arise naturally.